Our innovative line of Virtual Assistant training products provide service providers just like you with a variety of materials, in various formats, to help guide you through selling your Virtual Assistant services to your target market. We offer a comprehensive selection of ways to train for all your training needs from workshops, seminars, eBooks, quick tutorials, exclusive member sites, coaching to all-in-one learning systems at prices to meet all Virtual Assistants budgets. Why Our Virtual Assistant Training Products Work! Our network is the market leader for Virtual Assistants since 2003. Virtual Assistants are interested in the value that our training products can bring to their work and lives. They continue to come back time and again to our Virtual Assistant training programs and buy our training products based on the benefits they receive from our wide variety of training tools, and the innovated methods we have of providing these training tools. It’s these frequent Virtual Assistants that determine whether we stay in business by their continued loyalty. And since we’ve been in the Virtual Assistant training business for over 15 years, we feel our customers have spoken. Our training products are exciting and educational! We offer you the information and skills you need to get ahead in your Virtual Assistant business and stay there. A team of dedicated professionals ensures that all of our training products are kept up-to-date with the Virtual Assistant industry which is vastly changing day to day with the speed of Internet technology. Invest in your business by joining our VAinsiders Club. 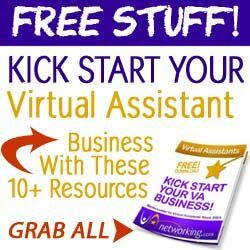 Consider upgrading your FREE membership to the VAinsider Club membership which includes everything from business templates/contracts and training webinars to VA eBooks and group coaching plus FULL access to our BUSY job board where you can find NEW clients! You can read more about the benefits of being a VAinsider by clicking here. CLICK HERE to learn more. 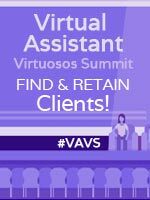 Attend the #1 Virtual Assistant Industry conference, VAvirtuosos. At #VAVS you’ll learn valuable information to help your VA business grow faster into the work at home sparkling empire you have always desired! CLICK HERE to learn more. As the first globally coordinated VA Certification Program of its kind, VACertified has brought together VA leaders from the 4 corners of the world to create a one of a kind program for virtual assistants. If you’re a proactive VA seeking the ultimate competitive edge, look no further. CLICK HERE to learn more. Or you already have a VA business but you’re feeling really STUCK in your entrepreneurial growth. 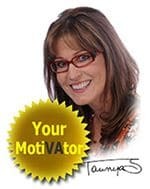 Tawnya Sutherland’s MotiVAtor Mentorship Sessions will help you clear the clutter and take revenue-generating ACTION. Your next business breakthrough could be just around the corner! CLICK HERE to learn more.